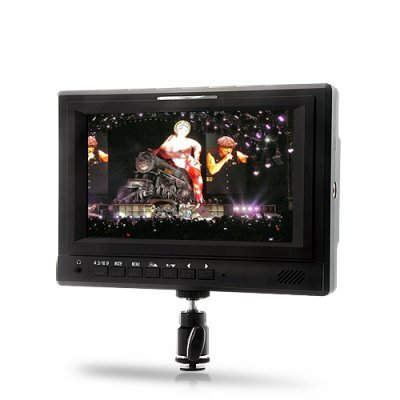 Successfully Added 7 Inch On-Camera HD Monitor "Horizon" - Focus Assist for Professional Video Camcorders to your Shopping Cart. 7 Inch On-Camera HD Monitor with Tally Light - Enhance your media arsenal with this professional camera accessory. Introducing the "Horizon" 7 Inch On-Camera HD Monitor with HDMI, YPbBr Input and a tally light! This amazing device combines light weight and affordability with a range of professional inputs and features. Equipped with a Sony V-Mount battery plate, you get intuitive control over the 1024 x 600 resolution images to keep your subject sharp, perfectly framed, and always in focus. You can have an external monitor that will serve every professional cameraman extremely well due to its advanced features. Anti-Glare, Image Multiplication, Image Freeze, Picture in Picture and many more features are available with this great camera accessory. With a high resolution 1024x 600 display, this monitor provides a clear and accurate image of what’s being recorded without having to look through your camera or video camcorder’s tiny built-in monitor. This makes framing, focusing and previewing faster and easier. Professional camera crews and photographers also require accurate color representation on their field monitor, and this kit provides just the same. The LED matte display has a 700:1 color contrast ratio so colors are rich and vibrant, and the matte display prevents any unnecessary glare or reflection. Need an amazing monitor for your $5000 high end camera setup? Want to join the league of ultimate camera dudes? Look no further! Want to shoot video with your Camcorder using the most professional monitor imaginable? No problem! The "Horizon" is the answer to all your problems, real or imaginary! This awesome monitor is something every filmmaker should have and must have on every set or shooting situation. It’s an invaluable piece of kit for getting a better idea of the picture and for expanded the functions of your already awesome camera setup. Ideal for a professional studio or video production set, this great external monitor will help the whole production team have a better idea of the camerawork and improve communication and work enjoyment. Professional performance and extreme convenience is what the "Horizon" 7 Inch On-Camera Monitor offers you. It’s a product that will be highly desired by many professionals and up and coming amateur camera enthusiasts. This high grade external monitor is brought to you at an amazing price that can't be found anywhere else! This great deal is available from the online leader of electronic gadgets, Chinavasion. This monitor uses a Sony V-Mount but a compatible battery is NOT included meaning for remote power it is best to use this product with a battery compatible with a Sony V-Mount. As a wholeseller, Chinvasion can not offer any advice on which batteries are compatible. However this monitor is suitable to use through its included power adapter. This monitor can be used with a camcorder so long as you have a way of mounting it to your camcorder. Most people who use this with their camcorders already have a steady cam rig or shoulder rig, so it can mount with your existing hardware by using the tripod screws located at the bottom and side of this device.